Driving down a narrow track covered in yellow leaves, open green fields either side, it was one of those perfect autumn afternoons. Summer in England had been unusually hot, with September bringing a confusing mix of both sweltering heats waves and uninspiring grey weekends. Yet by October, autumn had hit its stride, delivering crisp cold mornings, golden sunshine and the moment I’d been waiting for: the chance to finally light the new wood burner. I couldn’t get out of my summer dresses fast enough; clambering into thick black tights and digging out my coats. With autumn finally doing its thing, it was the perfect time for a little camping. With the summer crowds gone, kids back at school and those long summer evenings now impatient to wrap things up a little earlier, camping at this time of year is perfect (dropping temperatures aside). 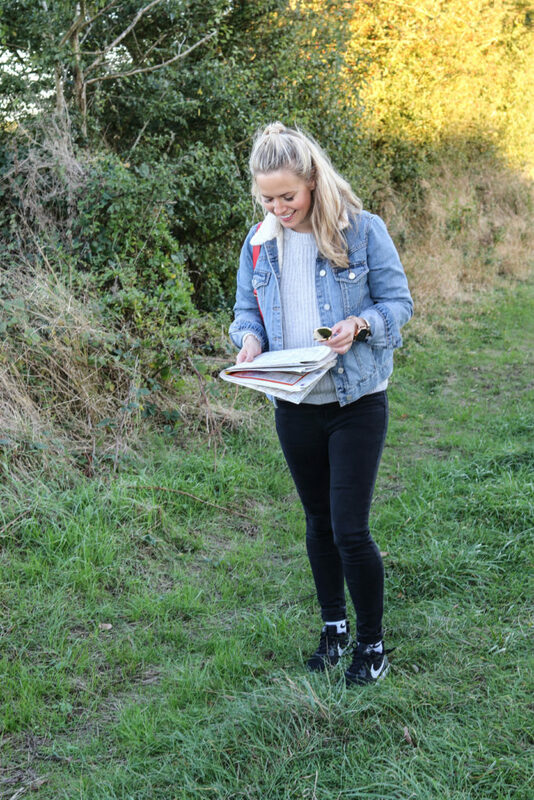 Good news then, that Fossil – makers of all things wonderful – were celebrating the start of my favourite season with the launch of Camp Fossil, their new range of watches, bags and accessories that capture the feel of those autumn days and the palette of the great outdoors. Included in this range is also Fossil’s new smart watch: the Fossil Q. Exciting. Now, you’ll know from my previous posts that ‘blogger’ events (and let’s not beat around the bush – PR activities) normally fill me with dread. I often have no idea what I am meant to be doing at these sort of occasions; lurking nervously in the corner feeling as though I am failing spectacularly in my role as ‘social media influencer’. Yet, Camp Fossil seemed different; a chance to genuinely get outdoors, light a stove and feed a few chickens. I wouldn’t have to mingle, jump out a plane or introduce myself as ‘Twins That Travel’. Instead, I could make a cup of tea, help myself to cake and watch the sunset, all within my very own fire-lit cabin. With Claire busy elsewhere, I therefore set off to rural Bedfordshire to seek out Camp Fossil and to immerse myself in nature. The camp was buried in the heart of a working farm, filled with horses; rowdy chickens; hungry goats; a motley crew of guniea pigs and rabbits; and roving sheep. As I pulled up , I was eyeballed by a suspicious-looking chicken and an escapee goat, both staring expectedly at me. I got out the car, looking around for signs of civilisation – an autumn breeze making the surrounding forest roar. There was no-one to be seen. Looking back down at the wary animals, I began to wonder what sort of event I’d come to. 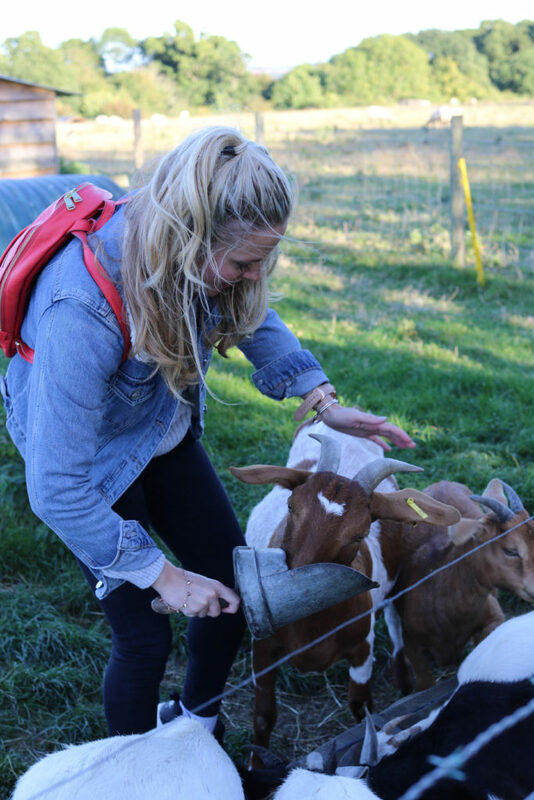 I didn’t imagine that either the chicken or the goat had a particularly strong opinion on what content I should be creating, or a list of deliverables to hand. The goat bleated at me and I shrugged. With nobody else around I decided that I’d try and find the Camp Fossil cabin; confident that there must be someone inside. Surely? Walking into the first barn I found, I was met with the sight of a few hundred rabbits and guniea pigs. My unexpected entrance into the barn seemed to stir the little critters. They went wild. If you’ve ever kept guinea pigs, you’ll know their trademark squeak: it’s piercing. Walking out the barn, worried I’d instigated a rodent-led riot, I wandered over to an open barn, full of chickens. Stood amongst the straw, watching the chickens running inanely in and out of their terrace of small houses, I guessed that this also wasn’t Camp Fossil HQ. One cockerel, sat atop a dazed pony (what was this place?) squawked at me until I backed out the barn, praying for someone else to arrive. Eventually, and with the sun now a few shades more golden, the very lovely Kelly from Fossil arrived. My rescuer, my hero, my knight in shining armour. Laughing, she steered me in the right direction of Camp Fossil, through bramble-lined fields and past a small pen of goats. Fossil HQ was situated snuggly within a wooden cabin, perched on the edge of a forest. Overlooking rolling fields, with a veranda soaking up the last of the autumn sunshine, the cabin was unbelievably peaceful. Welcomed inside, I was met with every camper’s dream: a cabin lined with candles, a wood-burning stove and a whistling kettle. Behind the warm stove were two small wooden doors, that when opened, revealed a hidden double bed; the perfect place to lie and listen to the softly hooting owls. The cabin smelt of wood smoke and of the freshly made Victoria Sponge cake waiting for me on the table; something I tackled right away, with the help of Kelly. 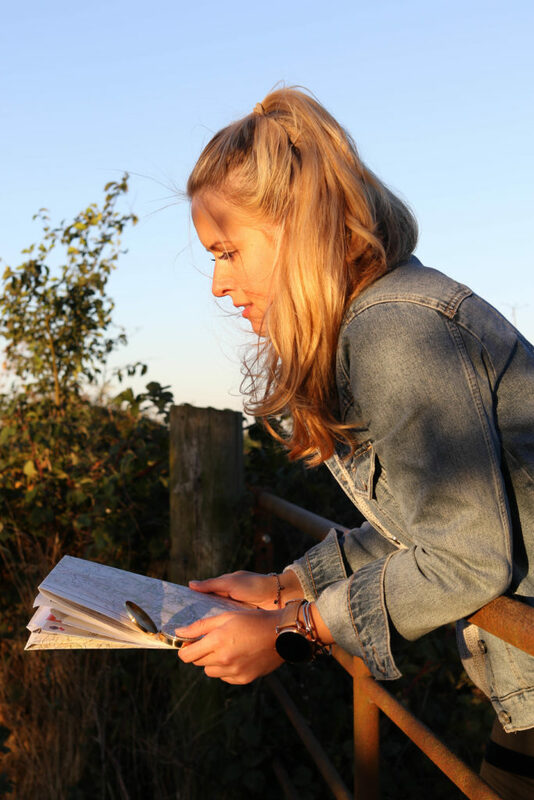 Watching the sun set, casting its shadows across the little cabin, I finally had the chance to check out Fossil’s new range of camp-inspired treats. 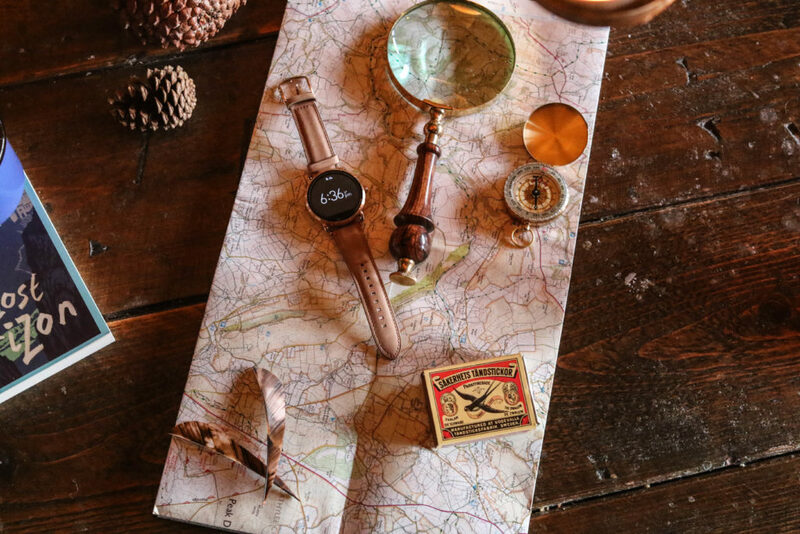 For anyone who loves deep mahogany leathers; navigational-inspired watches and beautifully crafted arrow-shaped jewellery, then the Camp Fossil range is absolutely worth exploring. 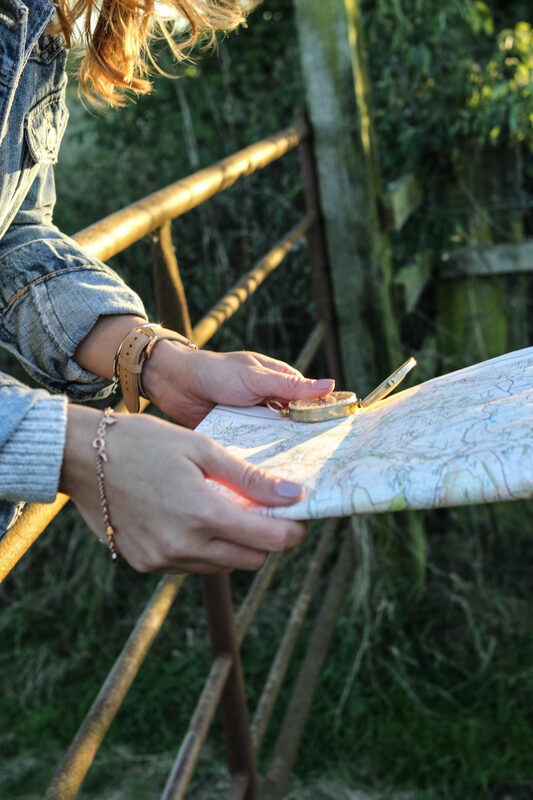 Hidden in and amongst brass compasses, Enid Blyton books and detailed local maps, the collection looked entirely at home within this outdoor setting. Wanting to make the most of the failing light, I decided to give the Fossil Q a whirl: a watch with all the beauty of a traditional timepiece, with the added benefit of being able to access your email, messages and daily step-count. 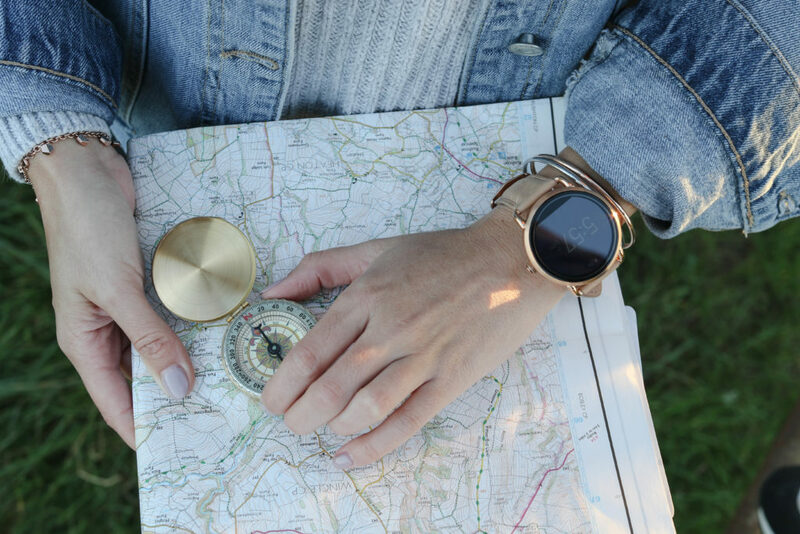 The Fossil Q is the newest ‘wearable’ technology on the market and a stylish one. Mine had a beautiful, thick leather strap and a chunky watch face; a trademark Fossil feature. Setting it up was easy and just required me to download an App to my phone, to pair the two. Within moments, my diary, emails and messages were feeding through to the now gently vibrating watch. Setting my step-count goal (an over-ambitious 10,000 steps), Kelly and I set off to explore the rest of the camp as dusk fell. The rest of the evening was a happy blur. With no demands to be Snapchatting my every move or vlogging whilst I unflatteringly ate a piece of cake the size of my face, Kelly and I hit up the local tree swing, screaming as we swung through the canopy of leaves. 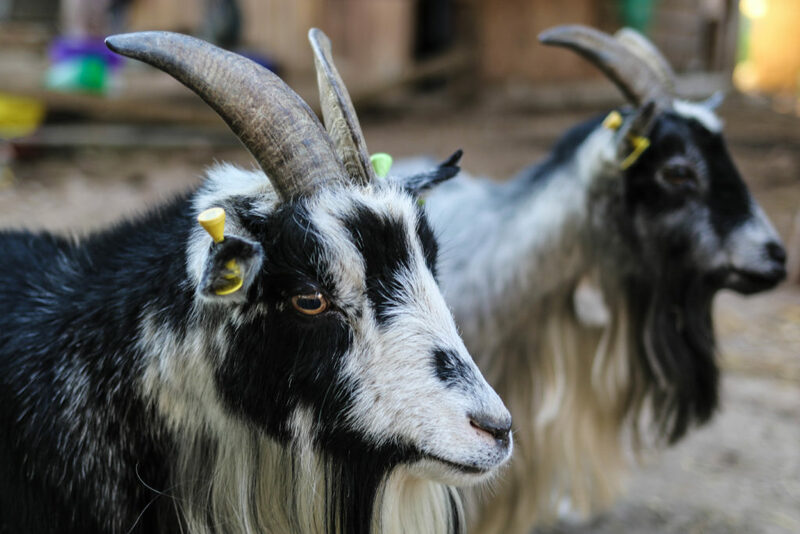 Dusting ourselves down, we then gave the goats their dinner (turns out these animals will stop at nothing to get their food – nothing), whilst trying to save our feet from their stampede of hooves. 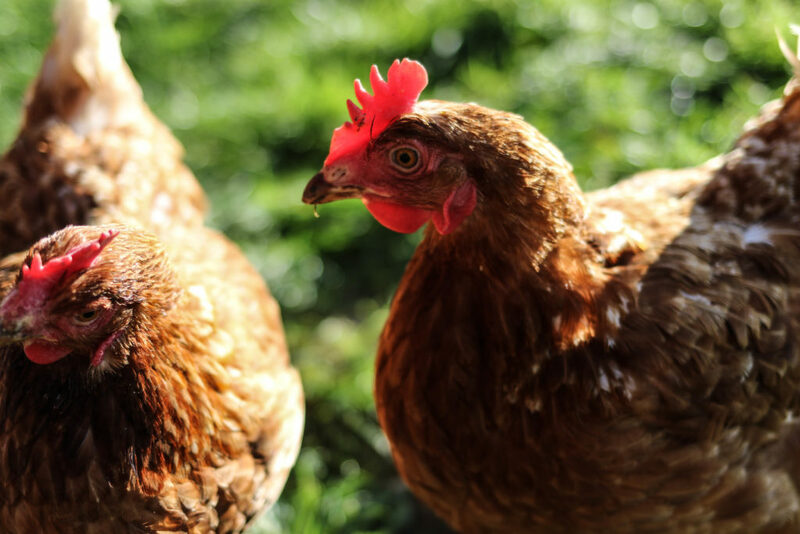 We took a twilight walk around the outskirts of the farm and watched the chickens turn in for the night, before heading back to camp to light the candles, the fire and put the kettle on. Sitting back, all there was to do was to listen to the birds chirping their goodnights, listen to the wind through the forest and of course, check my step-count. I’d not made it to 10,000, not even half, but who cared? I was here, at Camp Fossil, drinking tea and a world away from my usual night in front of my laptop working (online shopping). 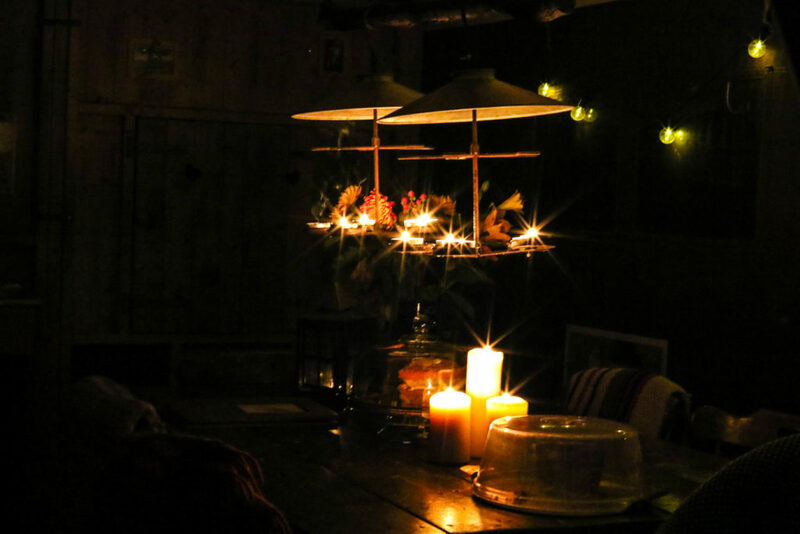 Watching the many candles twinkle in the now inky darkness and wrapping myself tightly in a woollen blanket, I wondered that maybe Fossil had this whole ‘blogger’ event figured out. Camp Fossil is more than just a campaign, it’s a lifestyle, and one I could happily adopt. Just perhaps without the stampeding goats. Thank you to the Fossil team for letting me stay at your oh-so cosy camp! 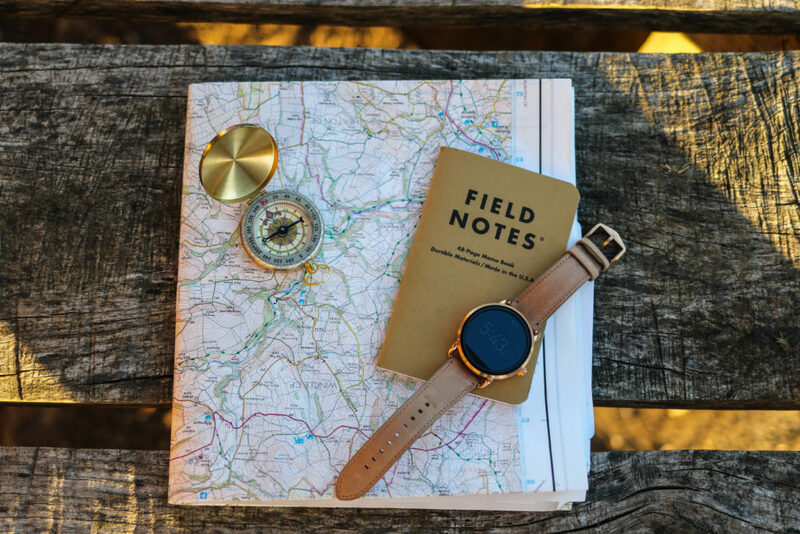 "November’s Giveaway: a stationery lover’s dream"
The watch looks gorgeous!! I was put off ‘smart’ watches as they looked a bit techy. But this is a beaut! Is there a guy’s version available? I really want one now! So pretty!